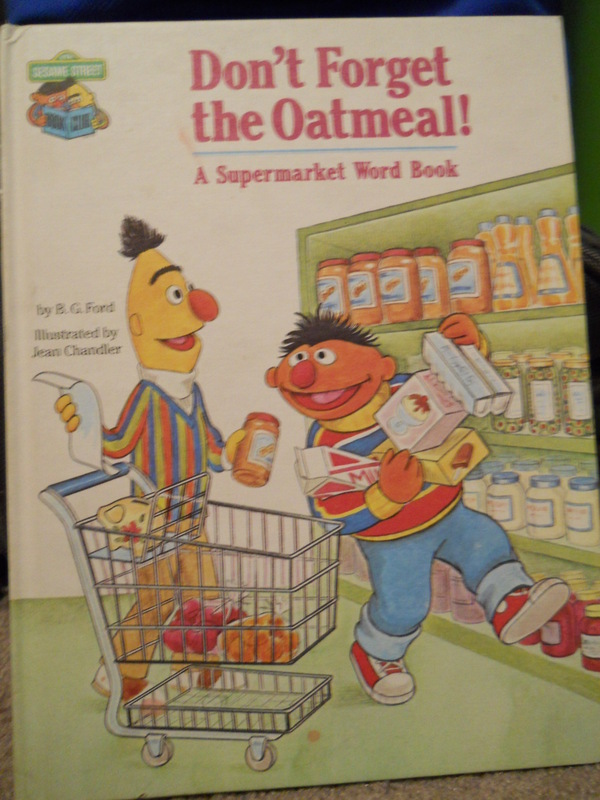 Tie a string around your finger and get ready to go grocery shopping with this weekend’s Golden Oldie review of a not-actually-a-Golden-book book from the Sesame Street book club. This was my favorite Sesame Street book as a kid. I was very excited to find it at a used-book store for $2 a few years ago. Identifying all the stuff at the grocery store was always a lot of fun. Cookie Monster’s cookies always looked really yummy too, even if I had no idea what the heck a macaroon was as a five-year-old. (I’ll admit it: I don’t think I knew what a macaroon was until I was 20.) I did always feel bad for the grocery store people who had to clean up after Cookie Monster’s mess. Anyway, the pages without a lot of items to identify aren’t as fun, but it’s still an entertaining story. The end upset me often though, because every time I re-read it, I hoped and hoped and hoped that they wouldn’t forget the oatmeal. But (SPOILER ALERT) they always forgot it.